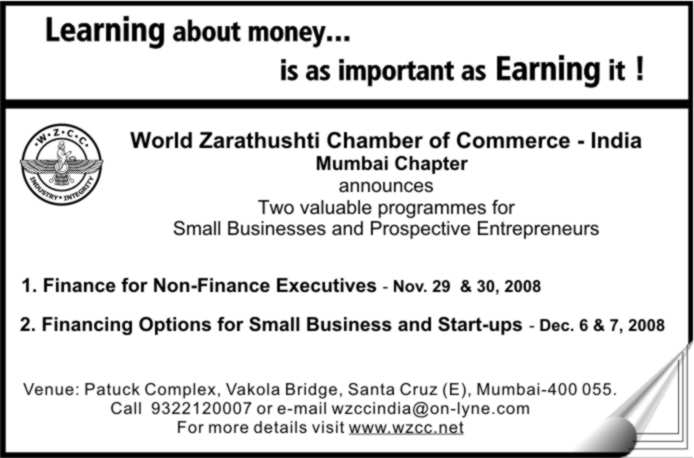 World Zarathushti Chamber of Commerce – India, Mumbai Chapter is pleased to announce two interesting Finance Programs. Am I managing my finances efficiently? Do I need Financial Advice? Am I pricing my products/services appropriately to remain competitive? Should I offer or avail of cash discounts ? Are my cash flows properly managed to yield optimum returns? What are the tools I can use to forecast and analyse my financial health ? What are the various options for finance for Small and Medium Enterprises? These programs (one and half days each) are to be conducted over weekends – Nov.29 & 30, 2008 and Dec. 6 & 7 2008 at Patuck Complex, at Santacruz (East). The first program would be conducted by professional trainers. This will be followed up by a second program where presentations would be made by selected bankers, financiers, angel investors and venture capitalists on various financing options available for small and medium businesses. All this will be accompanied by interaction with senior professionals from the community who will share their ideas and give insights for financing of SMEs based on their rich background and experience. We invite you to take the benefit of both these programs at a highly subsidized fee. What is more you can avail of the opportunity to interact with your peers and gain from their experiences in different business areas.